How did I get this internship opportunity? Hi everyone, my name is Frances Benstrong. 18 years of age currently doing my A levels, studying Biology, Geography and Business. 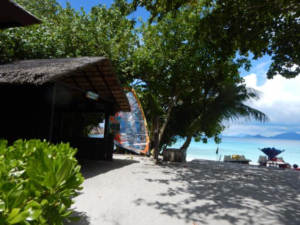 It was only last month that I read an article that an organization under the name of Seychelles Youth Aims Hub(SYAH) put up online about an internship program in line to the Blue Economy. Me being me a person who is most passionate about the ocean definitely had to seize that opportunity. I was eager to get to know more about the jobs on offer here in Seychelles relating to our beautiful ocean. SYAH was offering us as Seychellois the chance to go and explore different departments for 2 weeks relating to the Blue economy. And so I applied for the internship. I had to write a CV then filled a form which SYAH sent to us, writing a bit why we want to be part of this program. I waited patiently for SYAH’s response regarding if I made the top 25 interns for the program as they were selecting only 25 youth all over Seychelles. It was a month later that they answered and congratulated me for making the cut!!!!! I was super excited as I had no idea which department I was going to be in. It was only few weeks later that I learnt that I was going to be at WiseOceans . I couldn’t get any happier as I had already known some details about WiseOceans from previous programs I had participated in. I started working on the 5th of December. I had to wake up super early to get the bus to the Four Seasons Hotel. The first person I met there was Georgina Beresford she is the Reef Restoration Project Officer at WiseOceans. I got my uniform, had breakfast and off we went to my office for a week. The office was a little different from any I’ve seen before. It was 2 seconds away from the beautiful beach of Petite Anse. On the first day I was given a briefing about what I would be learning here at WiseOceans, the rules and regulations of the hotel. I met also my other work colleague Hannah Harries, a Marine Educator at WiseOceans. Every morning we went for turtle walk to check for any turtle tracks left behind if ever one had come to lay her eggs on the beach. But unfortunately during the week that I was there we didn’t spot any turtle onshore. 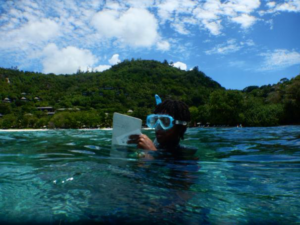 During my days at WiseOceans I learned so many cool information about the fishes from Hannah, we could find on the reefs here in Seychelles. I learned different ways on how to identify certain fishes by looking at the shape of their tail, which fin they swim with, their body shape, the different unique spots on their body and many other interesting characteristics. I learnt about the different families of fish such as parrotfish, wrasse, butterflyfish, angelfish, grouper, surgeonfish, damselfish and many others. 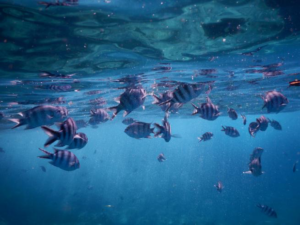 After learning so many fun facts about those fishes I was able to jump in the beautiful turquoise water at Petite Anse and spot some of those colourful fishes on the reef. Furthermore, I learnt so much more about Corals. From how they photosynthesize to how they grow and reproduce. I was super amazed by how much there was to learn about corals. It was only after learning so much about them from Georgie that I really started to take notice of those wonderful creatures. It was then that I really started looking at corals differently. From their structures to their colours. The main reason I was interested in the colours of corals was after conducting a CoralWatch survey with Hannah. I had never heard of such a survey. But after Hannah’s explanation about it I realized that it was a really simple survey. This survey was made by Queensland University to be able to check the health of corals all around the world. They have a website where anyone could quickly enter their data. 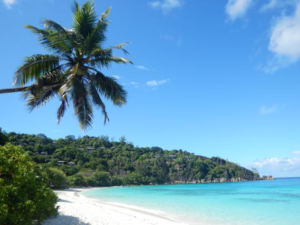 One of the biggest Project WiseOceans is conducting would be the Petite Anse Reef Restoration Project. 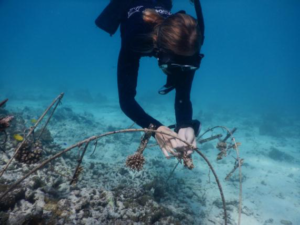 This project is basically to restore healthy corals. Many were lost due to the coral bleaching earlier this year and many other threats the coral faces. So I learnt that little fragments of corals are picked up and tied on a small piece of metal then left to grow for several months in a coral nursery in the bay. After the coral has reached a certain size they are transplanted on bare patches on the reef to grow. I also got the chance the check out the coral nursery for myself. It was really cool, I got to see different types of corals from the nursery and Georgie pointed them out and even named them. In conclusion learning at WiseOceans was indeed really fun and interesting. I met so many awesome people during my days over at Four Seasons. I got to gain so much more knowledge about the marine creatures which I’m most passionate about. I even learnt how to write cool blogs and got to interact with some guests and share my knowledge with them. I even accompanied a few guests on a guided snorkel with Georgie, that’s one of the most rewarding tasks, when you can share your knowledge and find that the guests get to appreciate much more the beauty and diversity below the sea surface. To finish, I think the WiseOceans team is doing a really great job in educating people about marine life. After my week at WiseOceans I realized that when you are doing something you really love and care about, there is always positive results that come out of it. 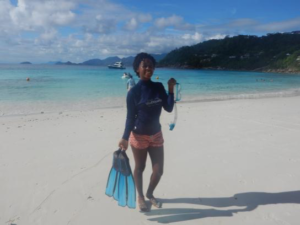 On this note I will just like to thank WiseOceans for this awesome experience and would advise other Seychellois people to go visit them and get to learn how rich our oceans are.